Kaiju-Con announced for June 15. “Kaiju vs Heroes: Mark Nagata’s Journey Through the World of Japanese Toys,” which features hundreds of contemporary and vintage Japanese vinyl toys, has been extended on view at the Japanese American National Museum through July 7. The exhibition is included in regular admission to the museum. In conjunction with the exhibition’s extension, the museum will host a day-long separately ticketed Kaiju-Con on June 15. Kaiju-Con will include a vendor hall, workshops, panel discussions, and demonstrations all related to kaiju and Japanese toys. It will culminate in a special free outdoor screening of “Godzilla” (2014) at 8:30 p.m., on the museum’s plaza. The Warner Bros. release is rated PG-13. In California in the 1970s, Mark Nagata was living an all-American childhood when an aunt and uncle serving on a U.S. military base in Japan sent him a box filled with colorful kaiju and hero toys. Kaiju translates to “strange creature” in English but has come to mean “monster” or “giant monster,” referring to the creatures that inhabited the postwar movie and television screens of Japan. The advent of these monsters brought about the creation of characters to combat them — hence the emergence of pop-culture heroes like Ultraman and Kamen Rider. For Nagata, those toys and the artwork of their packaging inspired him to study art, to zealously collect vintage Japanese vinyl toys, and to become a toy designer himself. At one point, his pursuit of these Japanese toys took him on a journey to Japan that brought new and unexpected connections to his cultural identity as an American of Japanese ancestry. “Kaiju vs. Heroes” showcases hundreds of dazzling vintage and contemporary Japanese vinyl toys and demonstrates how something as seemingly insignificant as a child’s plaything can help inspire an exploration of one’s identity. 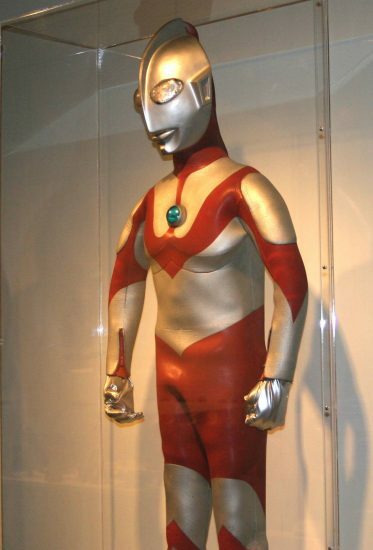 Nagata’s toys and artwork have previously been displayed at the Pasadena Museum of California Art (“Beyond Ultraman: Seven Artists Explore the Vinyl Frontier,” 2007) and at SFO Museum at San Francisco International Airport (“Japanese Toys! From Kokeshi to Kaiju,” 2013–2014). Kaiju-Con tickets, which will include same-day museum admission, go on sale May 1. Early-bird pricing, through May 31, is $25 for adults ($20 for JANM members) and $20 for youth ages 6–17 ($15 for JANM members). On June 1, prices increase to $30 for adults ($25 for JANM members) and $25 for youth ($20 for JANM members). All children 5 and under are free with a paying adult. The JANM Store continues to stock a number of limited-edition and JANM exclusives related to the exhibition. In addition, fans can purchase an Eyezon T-shirt for $25 and a “Kaiju vs. Heroes” mug, featuring original artwork by Nagata, for $15. An accompanying book about and by Nagata, “Toy Karma,” is available for $24.95. The Freeman Foundation is the major sponsor of “Kaiju vs. Heroes.” The Department of Cultural Affairs, City of Los Angeles, is associate sponsor. JANM is located at 100 N. Central Ave. (at First Street) in Little Tokyo. For more information, call (213) 625-0414 or visit http://janm.org/kaiju-vs-heroes.